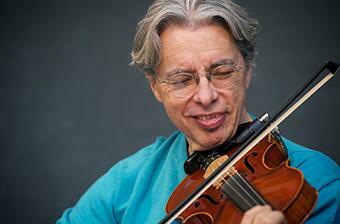 Darol Anger shares his distinctive style of fiddle playing and musical knowledge in hundreds of fiddle lessons online. Students in the ArtistWorks Fiddle course have unlimited access to these fiddle lessons online as well as behind the scenes content, interviews, performance and study materials (like fiddle tabs for beginners). What ultimately sets these fiddle lessons apart from other offerings is the ability to submit a video for review using the ArtistWorks Video Exchange Learning® platform. Darol reviews each submission and records a video response, offering specific guidance to take your fiddle playing to the next level. All students can access the Video Exchange library and watch each other’s interactions with Darol. This library is constantly expanding and may contain the key to unlock your playing. For over 40 years, Darol Anger has played on and produced scores of important recordings, and is a noted composer. Darol helped drive the evolution of the contemporary string band through his founding of pathbreaking ensembles such as: Republic Of Strings, the Turtle Island String Quartet, the David Grisman Quintet, Montreux, and the Duo. A MacDowell and UCross Fellow, he is a featured soloist on several recordings and motion picture soundtracks. Darol is also committed to string education and helped found the String Resource Board for the International Jazz Educators Association. Since 2012, Darol has extended his love of music education by offering online fiddle lessons at ArtistWorks. “Little Liza Jane” - Key of A -NEW! “Little Liza Jane” - Key of G -NEW! "The Crawdad Song" - Key of G - NEW! “Red Wing” - Key of G -NEW! “The Dead March” - Key of A -NEW! “Angeline the Baker” - Key of D -NEW! The F Scale: "Faded Love"
Mastery Means that it Feels Easy! Developing Speed Means Playing Slow First! "Brushy Fork of John's Creek"
Closed Keys: Using that Pinky! Double Stops: "Dark Hollow" and "Whistlin' Rufus"
Modal and Older Movement: "Reuben's Train"
Two Tactics, One Song: "Way Downtown"
Fourth Finger Workout: "Sally Goodin"
Fourth Finger Workout: "Back Up and Push"
The Mystery Note: "Salty Dog Blues"
Gypsy Jazz - “Minor Swing” -NEW! Gypsy Jazz - “Swing 42” -NEW! Gypsy Jazz - “Djangology” -NEW! Great opportunity to gain whatever you want from the site, depending on how interactive you want to be. The instructors move at a pace that was easy to follow, although somewhat technical if you’re looking for more intuitive. I loved the fiddle lessons. I have been able to accomplish so much with the multi-layer teaching approach that ArtistWorks provides in their music instruction. Added bonus that the instructor is very funny. Excellent service. Only slightly less effective than having the most amazing musicians actually at your home teaching you their chops. What a cool idea. Just incredible. I'm not able to spend as much time as I hope to, a widely used excuse. When I do get with it, the coaching and instruction are the best! I think this is fine learning system. A wonderful tool. Quality and coherent lessons in the comfort of your own home. ArtistWorks Online Music School. Inspirational learning on line with video feedback- big whopping YES! The lonely business of practicing in a corner somewhere with your musical instrument need not be lonely anymore. There's an entire community here at ArtistWorks, filled with musicians doing the same thing! With inspiring articles, interviews, and most of all music and lessons to keep you going, this is a real musical feeding ground! The beauty of this online ArtistWorks school, is that you can tap into it day or night. And, with the video feedback exchange, it's like a private lesson with a world-class musician. You can musically grow in direct proportion to the amount of energy you put into it, and also gain by watching your fellow students videos and the response to them by their teacher. All in all, I give it five stars because it has definitely helped me grow as a musician. Yay! Learn at your own pace in a friendly non-competitive but extremely knowledgeable environment. Darol's online lessons are awesome and a great way to learn tunes. The video lessons and responses are really fun and its really exciting to get feedback from a master fiddler. Great program! I've tried two different instruments (mandolin and fiddle) with Artistworks. In both cases I thought the lessons were engaging, and progressed in a logical way. It's very convenient to be able to do a lesson on my own schedule. It's great to be able to repeat sections that you didn't get the first time. You can learn a lot from other students videos as well as from the video exchange with the teachers. The study materials sections are awesome too, with tabs for all the tunes in the lessons and lots of others. I ended up dropping one instrument because I just didn't have the time to practice both of them, but that was not at all because I was unhappy with the lessons. Just be aware that learning an instrument takes time and lots of steady practice, but well worth it! I recommend Artistsworks to ALL of my friends learning to play! I have and will continue to recommend Artistsworks to ALL of my friends learning to play! I have even shown demos at neighborhood potlucks with friends I know who are struggling to learn an instrument. Most of the people in my circle are around retirement age and this is a great learning tool because you can move at your own pace. I love my teacher, Darol Anger, and all he brings to his students...plus his sense of humor helps too. I can only imagine that all the other teachers are excellent in their instrument as well. Thank you, thank you and thank you again...from a total beginner fiddle player, I'm about to join a neighborhood trio :) I'm so happy and know I got there with Artistsworks. I have enrolled in 5 different programs over time and found them all very good. Awesome fiddle instruction and the support and recommendations from him are spot on to help you improve. Many thanks.